Hello, I’ve downloaded this template and installed it. There’s only one thing I don’t like: the gadget Recent Comments at the end of the columns…how can I remove it???? ***REMEMBER TO TAKE ONLY ONE OUT! Problem~ Date does not come up in tabs. Ideas? 1. the side date appears as “undefined” how do I fix this? 2. I have followers but would like to have them appear under the Friends and Links section . . . how? 3. How do I add a description to the What Is This Page? Help! How do you get date to show? the side date appears as “undefined” how do I fix this? How do I get the date to actually appear with this template? To get the date to appear you have to go to Settings-> Formatting in Blogger. From there, change teh time stamp from (2:56 pm or whatever) to the DATE view. I tried Zack´s tip but the date still shows as “undefined”. Any other idea? – how can I activate “categories”? – how can I remove the box of recent comments? I´d like them to appear just when required. Thanks a lot! i have the same problem.. the date will still show as undefined no matter wath…. help!! I´ve tried all the date formats and “undefined” is still there!I´m really fed up! …thanks anyway! Vindicated’s fix worked for me! me too! 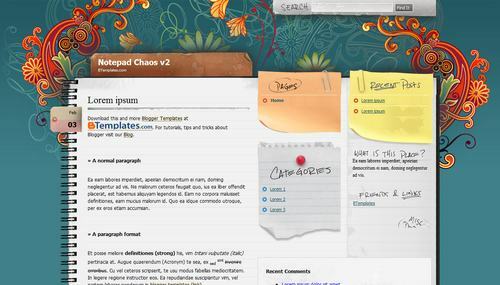 then how to change the font and color of title of the blog? ?pls help!! How do you get the Blogger Navbar thingy to show up again? Anyone knows how to activate the “categories”, please? I am having some serious issues. I love this template by the way!! 1. How do you get rid of the recent comment box at the bottom? Or at least move it somewhere else. 2. How can you move the About me and blog archive from the bottom to the right side? I’m new to all of this and I have no clue what to do. Please help!!! De verdad estoy muy agradecida despues de visitar no se cuantos sitios encontré uno donde poder descargar la plantilla de este modelo!!! de verdad estoy muuuuuuuuuuuuuy Feliz!! Not sure if I’ve done something wrong or not, but how do I get my Recent Posts to appear? So far I’ve added two of them, but still nothing gets listed. Help? Oh and my recent comments don’t show up either. Help again? I’m looking to replace the header, but I’m not sure how. Right now, there technically is no header, because the top 3 tabs and top of the notebook are actually part of the green background. I have already replaced the background, but the notebook is cut off because there is no header. Does anyone know how to add it using html? I just luv it!! it worked great!! thank youuu! LOVE this template! I’m still working a few kinks out (like all my buttons and stuff are too big to put under “misc debris” without cutting off the words…but it’s just perfect. Thanks for your hard work in making it! Under “Followers” on the right hand side, there are some things in a hand-written font that are cut off. I’m not sure what they’re supposed to say but I’d like them to show up so I can determine whether we’d like to keep them or not. Every time I type something under one of the other headers (Recent Posts, What Is This Place?, etc) it drops further and further down. Hey Chloe- I checked out your blog and I love it!! my RECENT POSTS DON’T SHOW. what should i do ? Add a new Feed gadget (with your feed url for posts) in that place. You can read more in our FAQ. I decided to keep my “about me” section and my “blog archive” but the links are that ugly standard blue. Any way I can fix that to make it match the rest of this awesome layout? Oh and “recent comments” too! How do you add more elements to the Pages list? I have been using this for a while. I love it. Some people can’t figure out where to comment. Do you know what part of the code is the leave a comment part? I want to change it, but I am confused. It says “posted under” under each of my posts. How do I get rid of that? Love the template! One problem though. My recent posts show up correctly in column 3 on the yellow sticky, but then they are repeated in column 2 as just white bullet points. Do you know how to make this duplicate of my recent posts go away? how i get rid of the “catagories” box?